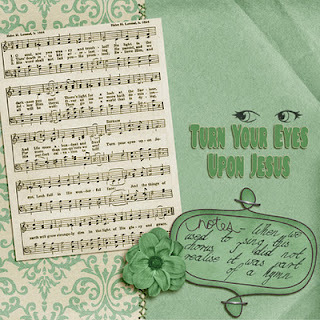 For the second challenge for this year, Patter has given us the Hymn - Turn Your Eyes Upon Jesus. 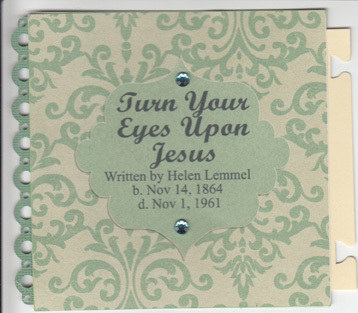 With my Digital page which features the hymn I have added a little note about it which I plan on doing each time that there is some memory item about the hymn that I would like to share. When my husband and I attended Liberty Community Church the chorus of this hymn was sung often and I did not realise it was part of a hymn. I thought it was just a chorus. When searching for what scriptures spoke to me with inspiration from this hymn I could not go past the scripture that Patter also used - Hebrews 12:2. 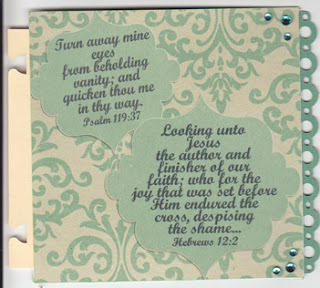 But I did find a verse in the Psalms which I feel goes so well with it. We need to turn our eyes away from the things of this world to keep them focused on "looking unto Jesus". As planned I have created a digital page for the Hymn and a double-sided papercraft piece for the scriptures but I needed to type up the scriptures so used my digital software so I could make it make the hymn page. 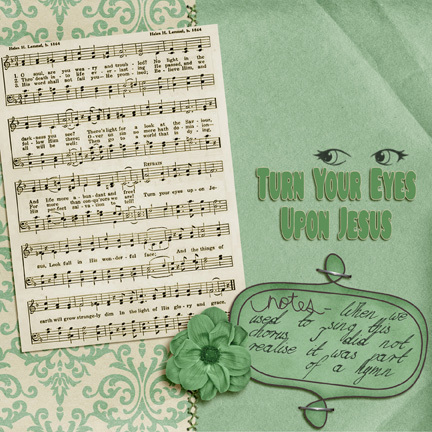 For this digital page I used a kit called " Afternoon Delight" by Victoria Feemster and the eye brush is by Anime and the hymn sheet was found on the web. Anne-Marie, I love the soft green colors you used for this. I really like the double scripture sheet. Beautifully done! I love your scripture and those eyes really make the page! I am having some trouble with mine and this really gives me some insight! Lovely soft colours and the addition of your journalling about singing the hymn makes it really special. Hi Anne Marie: I was so blessed to find your lovely blog and see your beautiful work - both of which are so glorifying to the Lord Jesus Christ. How beautiful! I also wanted to let you know about another challenge blog where our only challenge requirement (ever) is to use scripture in your art. We would be so blessed to have you join in our challenges. Hope to see you soon - it would be our pleasure to have you.